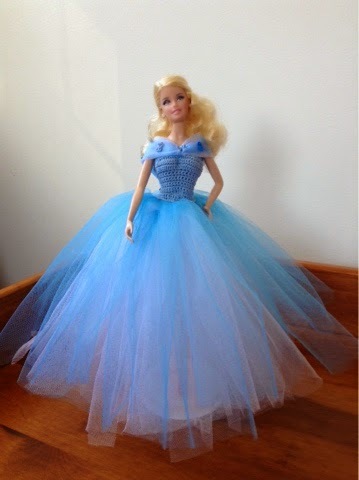 Here is the pattern for Cinderella's blue ball gown! I hope you enjoy this pattern. Has anyone seen the movie yet? Row 1: With light blue crochet thread, ch 42, sc in 2nd ch from hook, 1 sc in each of next 17 sts, 1 hdc in next st, 1 dc in next st, 1 tr in next st, 1 dc in next st, 1 hdc in next st, 1 dc in each of last 17 sts, turn. Row 2-3: Ch 1, 1 dc in each of next 17 sts, 1 hdc in next st, 1 dc in next st, 1 tr in next st, 1 dc in next st, 1 hdc in next st, 1 sc in each of the last 17 sts, turn. Row 4-11: Ch 1, 1 sc in each st across, turn. Row 12: Ch 1, 1 sc in each of next 10 sts, 2 sc in each st to last 11 sts, 1 sc in each of the last 11 sts, turn. Row 13-15: Ch 1, 1 sc in each st across, turn. Row 16: Ch 1, 1 sc in each of next 10 sts, (sc dec) in each st across to last 11 sts, 1 sc in each of last 11 sts, turn. Rows 17-18: Ch 1, 1 sc in each st across, turn. Fasten off. Note; The sleeves are a bit complicated, so I hope I have explained everything clearly. Cut 2 pieces of blue tulle 7 inches long. Fold each piece until it is about a centimeter wide. Gather one end of each folded piece. Sew the gathered edges of each piece together, making sure to hide the rough edges. 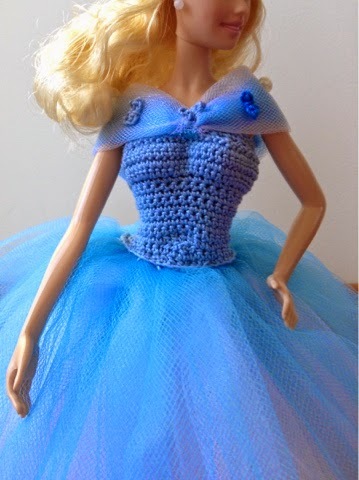 Sew the joined piece to the crocheted top. Ch 7. Sl st in 1st st. Gather middle of ch circle. Sew each butterfly onto the sleeves of the dress. Skirt For the skirt, all you have to do is make two long, white tulle skirts and layer a blue one over those two skirts. Click here and follow the directions to make two white skirts and one blue one. For the first white skirt, cut strips of tulle that are 6 inches wide and 16 inches long. For the second white skirt, cut strips of tulle that are 6 inches wide and 16 1/2 inches long. Sew these two skirts together. Make a blue skirt with strips that are 17 inches long. Sew this skirt to the other two white skirts. Now sew the whole skirt (which is all three skirts sewn together) to the top you crocheted earlier. I really want to see the cinderella movie. I do, too. :) It looks awesome! Do you mean the background colors of my blog template or the part of the pattern where you layer three skirts? Thank you so much for this gorgeous pattern. My 6 year old grand-daughter will absolutely LOVE it!! Thank you for sharing your beautiful pattern. I think there is a mistake in the pattern. In rows two to three the pattern only allows for one breast allowance.?? No, there is no mistake. Rows 2-3 are making the point at the bottom of the top. I hope that helps! Would love to make this beautiful gown but can't read pattern-- help please??? Sure how can I help you read it?